Finding potential B2B sales leads from recently funded companies is the first step, but the next step is turning them into qualified opportunities. Here's some important steps you may be missing to do that much more efficiently and effectively. There is a need for your product or service to solve a business challenge. Your point of contact has authority to purchase or can and will influence the person that does. The company has or will soon have the budget to purchase your product or service. The timing is right or will soon be right for your offering to be leveraged. The second point is where many business development or sales reps often get tripped up. Recently funded startups are often so new that it is quite difficult to find out who some of the key decision makers are or even the right telephone number to reach someone. However, what some people don't know is that when a company raises money from private investors, called a private placement, there must be a form (SEC Form D) filed with the Securities and Exchange Commission, that lists one or more Executive Officers and has a direct phone number. 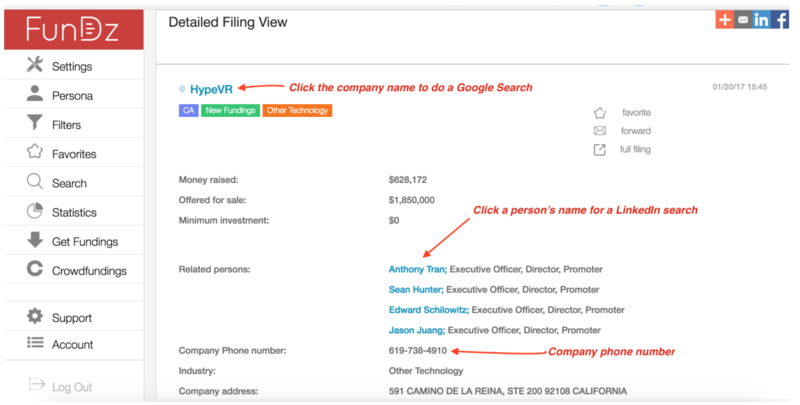 As seen in the image below from the Fundz app, the "related persons" in this filing gives you several executive officers and a direct number. This number will sometimes even go directly to the first "related person" listed. By also being able to quickly perform a LinkedIn search on these people (as well as a Google search on the company), in just a few minutes you can learn some great information about not just the company, but the people behind it, allowing you to engage in a much more empathetic conversation, which is so critical in building trust. What this means is that Instead of calling and just saying you heard they raised some money and then asking if are they interested in your product or service, this understanding of who they are lets you personalize the conversation in a way that is usually much more well received by them. Remember, connecting first ahead of your competitors is proven to help you win more deals. By simultaneously leveraging tools such as LinkedIn and Google, you can further improve your odds and quickly turn a startup funding or other sales trigger events into a new sale.